Millions of British, Dutch, French, Danish, Spanish, and Portuguese nationals permanently reside in the overseas parts of their Member States. These people, like the companies registered in such territories, often find it virtually impossible to determine what law applies when legal decisions are required. Although Article 52(1) of the EU Treaty clearly states that EU law applies in the territory of all the Member States, most Member State territories lying outside of Europe provide examples of legal arrangements deviating from this rule. This book, for the first time in English, gathers these deviations into a complex system of rules that the editor calls the ‘EU law of the Overseas’. • territorial application of human rights treaties. Twenty-two leading experts bring their well-informed perspectives to this under-researched but important subject in which, although rules abound and every opportunity to introduce clarity into the picture seems to be present, the situation is far from clear. The book will be welcomed by serious scholars of European Union law and by public international lawyers, as well as by policy-makers and legal practitioners. Part One: Introducing EU Law of the Overseas. Chapter 1. 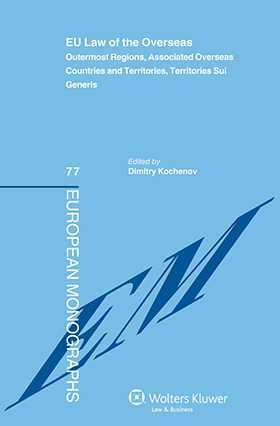 The EU and the Overseas: Outermost Regions, Overseas Countries and Territories Associated with the Union, and Territories Sui Generis; D. Kochenov. Chapter 2. Outermost Regions, Overseas Countries and Territories and Others after the Entry into Force of the Lisbon Treaty; J. Ziller. Part Two: The Significance and Legal Specificity of the Overseas in the EU . Chapter 3. Implications of European Integration for the Overseas; D. Custos. Chapter 4. Specific Measures for the Outermost Regions after the Entry into Force of the Lisbon Treaty; I. Omarjee. Chapter 5. Access to the ECJ by Courts in Overseas Countries and Territories; M. Broberg. Chapter 6. The Principle of Territorial Exclusion in the EU: SBAs in Cyprus: A Special Case of Sui Generis Territories in the EU; S. Laulhé Shaelou. Part Three: EU Acquis in the Overseas. Chapter 7. Free Movement of Services and Establishment in the Overseas; I. Goldner Lang, T. Perišin. Chapter 8. EU Citizenship in the Overseas; D. Kochenov. Chapter 9. The Overseas Application of the Customs Duties Provisions of the TFEU; A. Tryfonidou. Chapter 10. The Free Movement of Capital in the Overseas Countries and Territories; W.W. Geursen. Chapter 11. EMU and the Overseas; F. Amtenbrink. Chapter 12. EU Crime and Policing and the OCTS; M. Fletcher. Chapter 13. Between the Devil and the Deep Blue Sea? Conflicts in External Action Pursued by OCTS and the EU; S. Blockmans. Chapter 14. Benign Territorial Human Rights Colonialism? The Application of Human Rights Treaties in Overseas Countries and Territories; A. Hallo de Wolf. Part Four:The Overseas: Comparative and Interdisciplinary Approach. Chapter 15. Europe as a Pacific Power; K. Muller. Chapter 16. Restructuring Europe from Its Margins: Overseas and Their Integration within the EU’S Space; T. Pullano. Chapter 17. The Overseas Countries and Territories Association: The Added Value of a Concerted Approach; F. Baetens. Chapter 18. The Status of Northern Cyprus under EU Law: A Comparative Approach to the Territorial Suspension of the Acquis; N. Skoutaris. Chapter 19. The American Experience with Territorial Governance; G. Lawson, G. Seidman. Postscript. Chapter 20. Defending the Democratic Rights of EU Citizens Overseas: A Personal Story; M. Eman. Map of the EU’s Overseas.